The 310 Atlas Grip is a very popular garden glove. 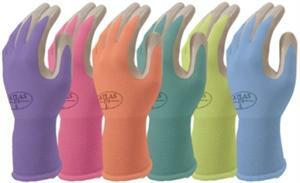 The glove is free from perspiration, has a good grip, lightweight and ensures a comfortable fit. This is a very popular garden glove. The ergonomic design makes the Atlas work gloves ideal for a variety of inDustries, such as freight handling, gardening, construction, sailing, fishing and agriculture. Patented dipping process allows glove to remain flexible, reducing hand fatigue. These great gloves conform to the contours of your hand for maximum dexterity. The 310 Atlas Grip is used for jobs requiring extra dexterity, good grip when wet, and the 310s latex palm are slightly lighter and more flexible than the ATLAS FIT 300The 310 Atlas Grip is can be available in passion purple, mango orange, fuchsia pink, teal, granny apple green, and blue, yellow, black also.